A wonderfully early, 45-minute session, kicking off at 6.30am, bursting with a fun and positive atmosphere! Taken by our long-standing trainer Alex Bignell, conveniently situated in King George’s Park, it is a great way to kick-off a Thursday and get you ready for the weekend. Given the early start, this session tends to generate a smaller, more-focused crowd and incorporates a range of strength and conditioning exercises, including working kettlebells, battle ropes and TRX (a type of balance cable). We meet at the entrance to King George’s Park on the corner of Bodmin Street and Acuba Road. Come through the gates and we’re just to the right. I have been a One Element Trainer for 6 years. I take the Monday evening session on Wandsworth Common and a weights based training session on Thursday mornings in Earlsfield. I have significant experience in two Martial Arts disciplines. In addition to this I have always enjoyed athletics, lifting weights and maintaining strength. I enjoy endurance cycling, sprinting, and pretty much anything else demanding. I love the team spirit in One Element. It is very supportive but people are also pushing themselves to achieve more. I love seeing members enjoying exercise, improving their skills and fitness and surprising themselves. Probably a comprehensive barbecue. Steak, chicken, lamb, potato salad. I have 2 young boys so a lot a of walking and cycling. I play several string instruments and I like reading and watching films. What is your favourite quote? 'I don't have any weak points'. - Arnold Schwarzenegger 1975. 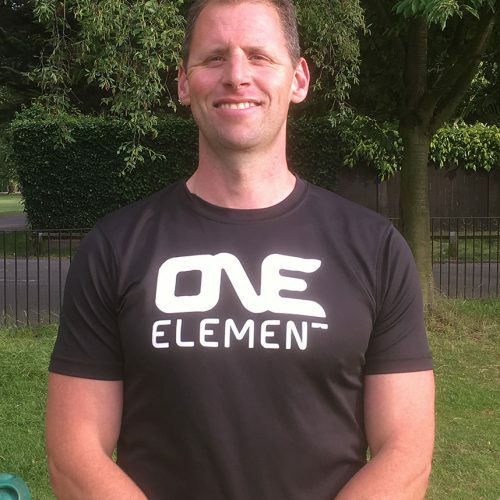 You will be greeted by your One Element Trainer (wearing a One Element top with ‘Trainer’ on the back) and introduced to some of our long-standing members. Every session begins with a warm up, gradually building in intensity to ensure you are suitability prepared for the session ahead. You’ll see the supportive and positive atmosphere we’ve created and soon settle into the session. The main body of this session lasts about 35 minutes and is predominantly a mix of kettlebells, battle ropes, medicine ball and TRX. We finish the session with a good stretch. You will leave a One Element training session feeling energetic and positive – that’s a promise! If you don’t believe it, join us on Instagram to see the latest feel-good posts.